If you are planning a wedding soon, you mustn’t miss reading this post that lists the 35 wedding table runners that will not merely act as eye candies, but, will also make your wedding an event to be remembered! Yes, with our trendy and unique table runner ideas, your wedding table will become the limelight of the occasion, and will take wedding table settings to a whole new level. For any wedding, either summer or winter, table decor plays an essential part and we cannot forget about table runners when thinking of decorating tables. Its not just table centerpieces that need to be chosen wisely, the table runners too must be selected carefully after you do some serious research. Below, you would find an exhaustive display of unique and trendy wedding table runner ideas that range from modern, traditional, rustic, cheap, DIY to high end. 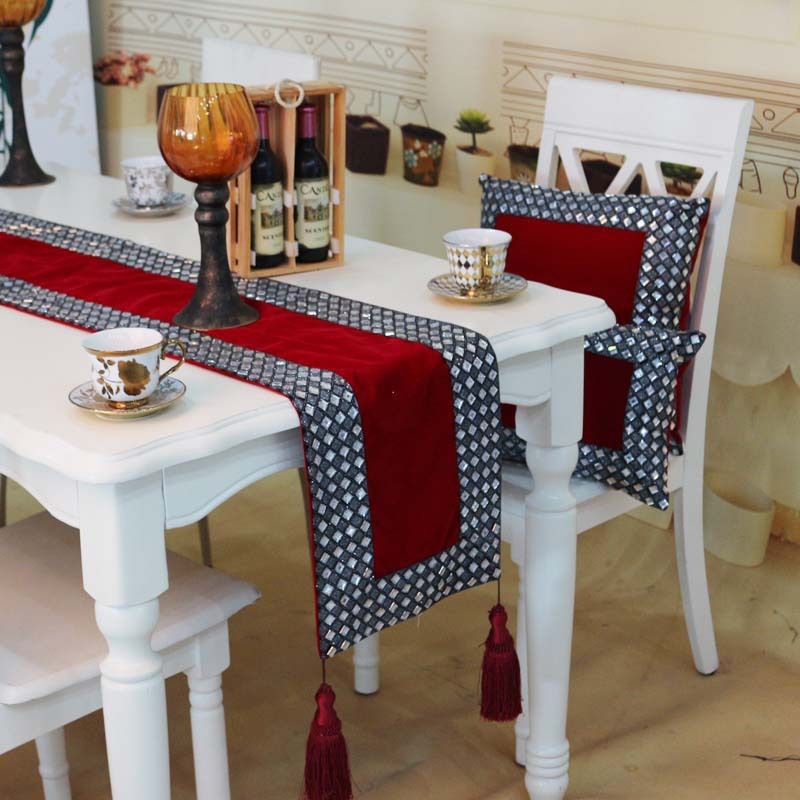 Do go through these table runner ideas and see your horizons expanding! 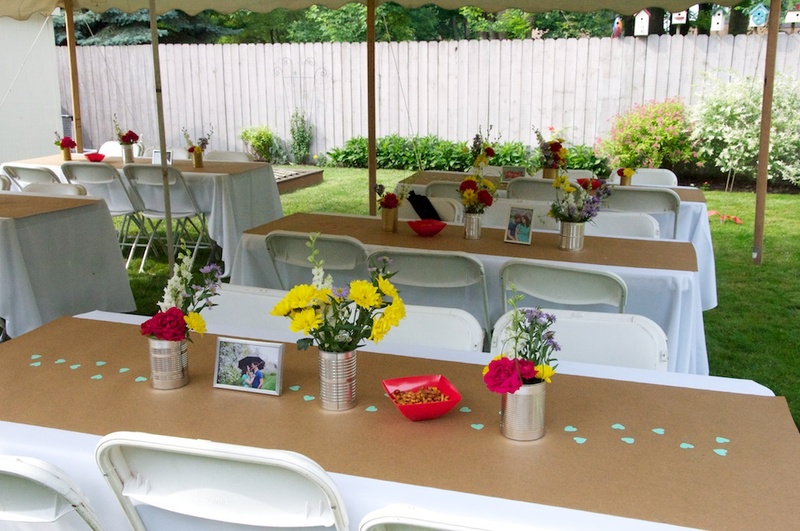 Planning a summer wedding anytime soon? 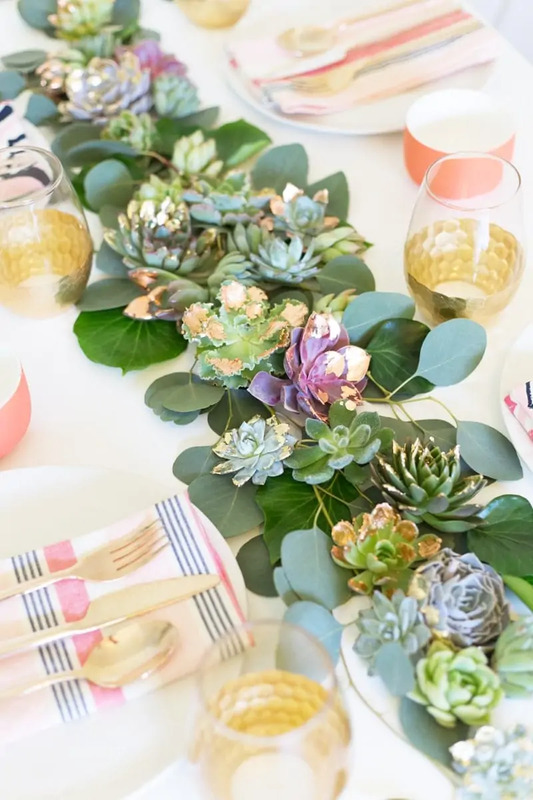 If yes, do look below to get refreshed with these amazing wedding table runners that have all but one thing in common – yes all these are natural and lend a fresh touch to your wedding decor. From leaves, to moss, to flowers of various kinds and colors, green table runners are the way to go for spring weddings when you want your day to be the most talked after event. Roses, hydrangea and lots of other flower varieties can be used for laying out natural table runners as in some of the images. Green and floral table runners lend a sweet touch to your decor for sure. Strips look very stylish and are always in vogue. Be it parties or weddings, striped decor looks chic and very much in tune with modernity. When speaking of strips, we cannot forget two most primary colors like black and white. This is a lethal combo and can make any occasion the talk of the town. Seen below are the images of black and white wedding table runner ideas where the main feature to capture your attention are the strips on table runners. 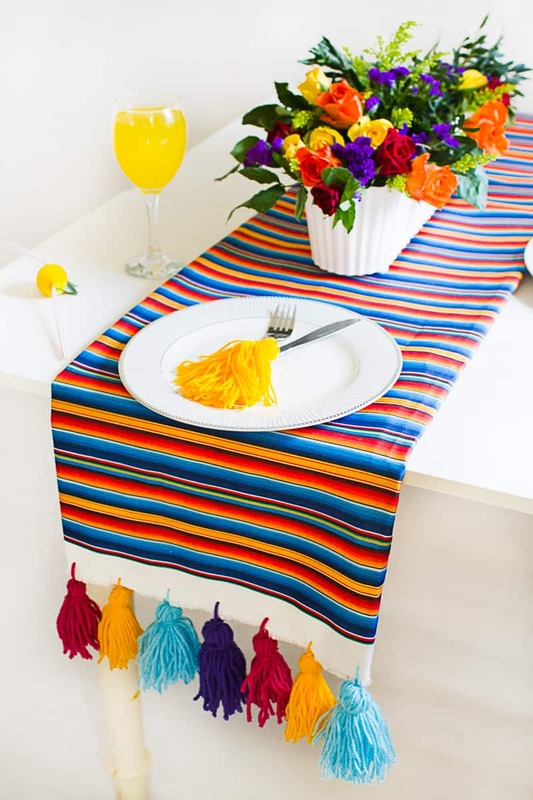 While, you can place simple and trendy looking striped runners for a smart look, there are options to attach tassels in various vibrant colors at the tips for a funkier look. Are you searching for such table runners for wedding that look classy yet very trendy? If so, take inspiration from these showcased lacy wedding table runner ideas that have lace as the main element coupled with others like burlap. Lace is a popular choice as far as dressing wedding tables is concerned simply because of its ethereal appearance. 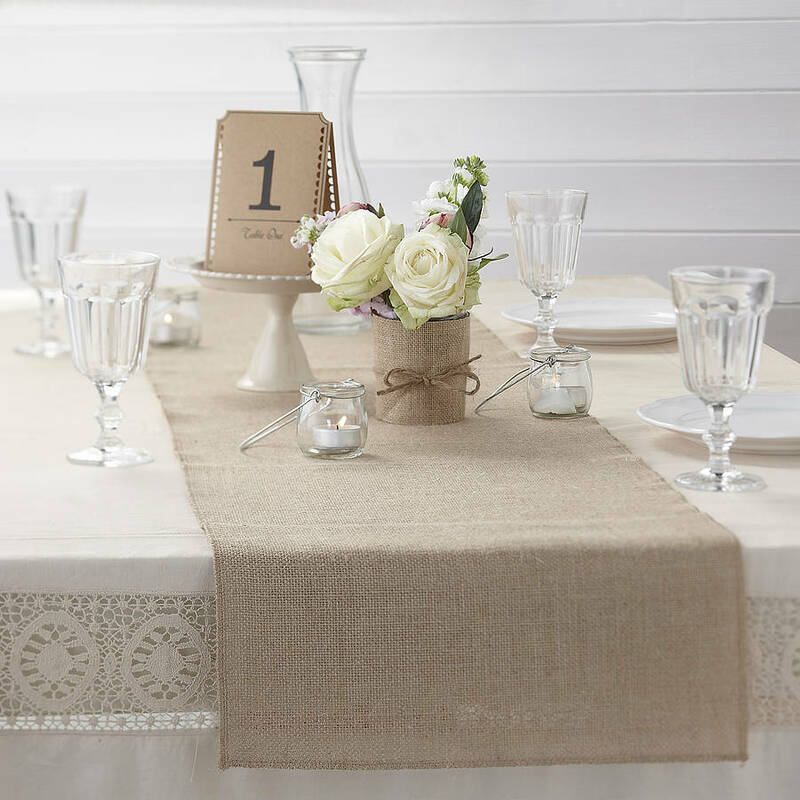 Seen here are some very fabulous looking wedding table runner ideas with lace, the first being a runner made with a combination of burlap and lace prints. The burlap runners can either have their borders adorned with lacy prints, or the whole burlap can be decorated using lace prints as can be seen in the images below. In any case, these wedding table runner ideas with lace look rocking! Purple is a glamorous color to be seen splashed on many features involved in home and venue decoration, and your wedding tables too are included in this list. 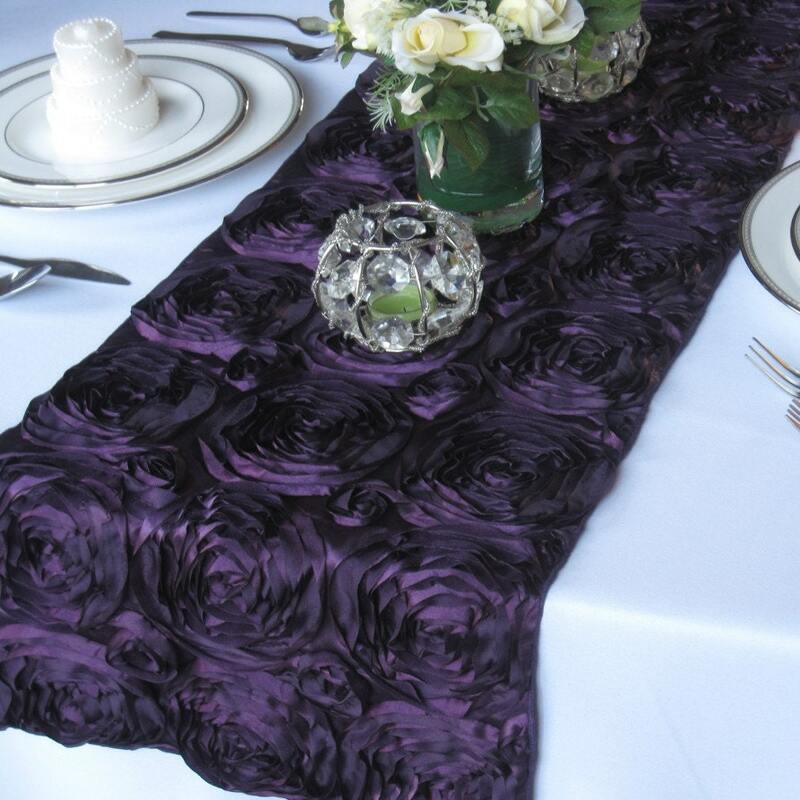 The various shades of purple can be used on table runners to lend a touch of glamour to a wedding decor. 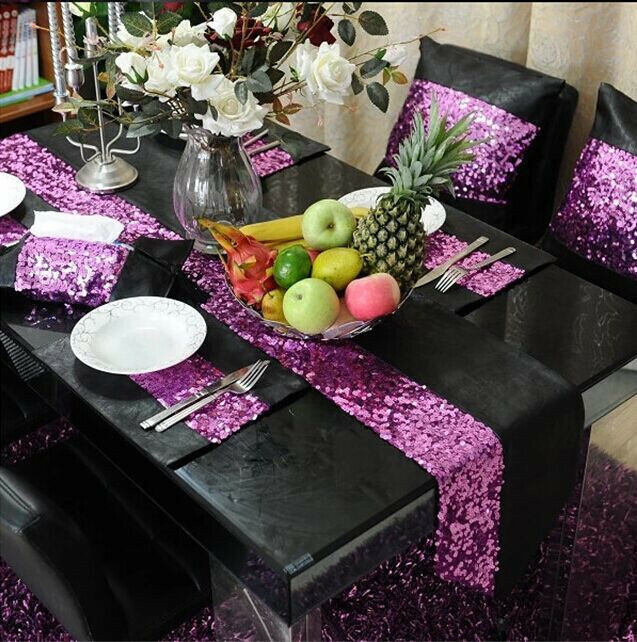 From purple table runners made out of satin and ribbon, to those with shimmering sequins, you have multitude of choices as far as table decoration is concerned. 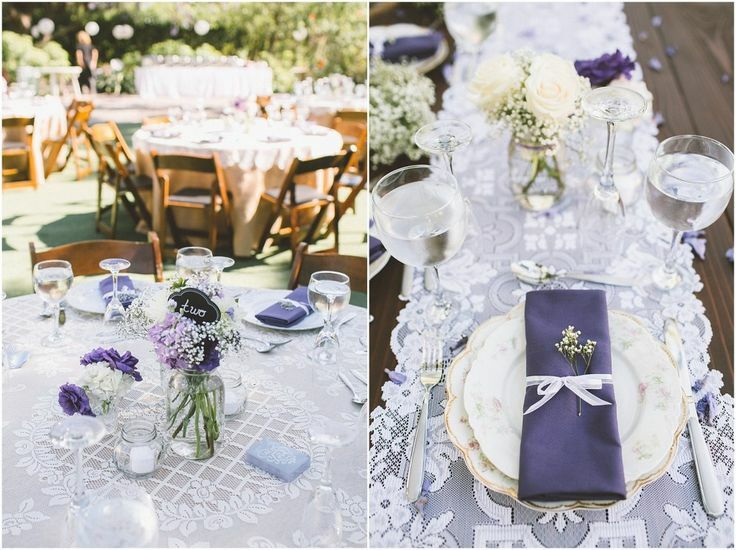 In one image that might be called very chic, the table runner in purple has swan prints in silver. 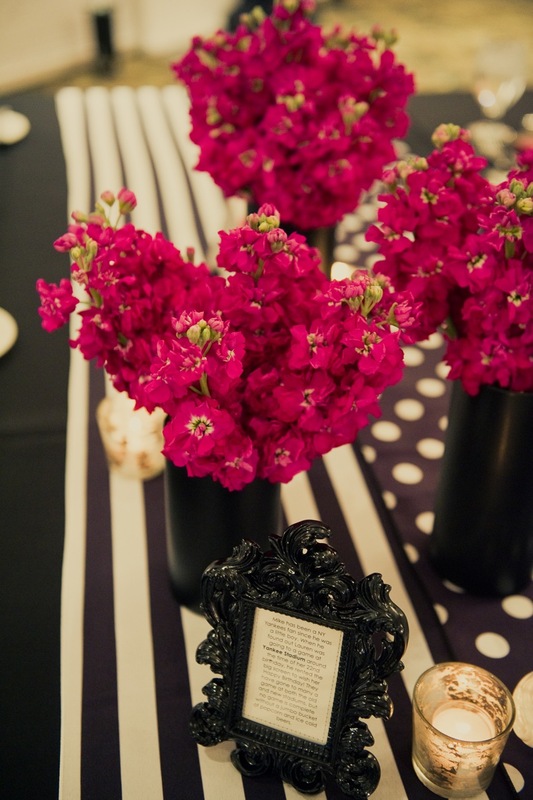 It definitely raises the glam factor of this wedding table! The color red and weddings rock together and with these below showcased red table runners for wedding, we are sure your wedding will be marked as the most glamorous event of all time! Yes, red is a stylish color and red accents add a chic look to any decor. From red floral printed table runners, to red runners with mirrored borders or sequins, to those with white designs, there are many kinds of table runners that involve red and many shades of it. When weddings are concerned, metallic accents must be included somewhere in the decor, specially tables. Silver accents on wedding tables can make any kind of wedding stylish and trendy, just like in the pictures where the tables have been decorated with runners, all of which have silver shades. 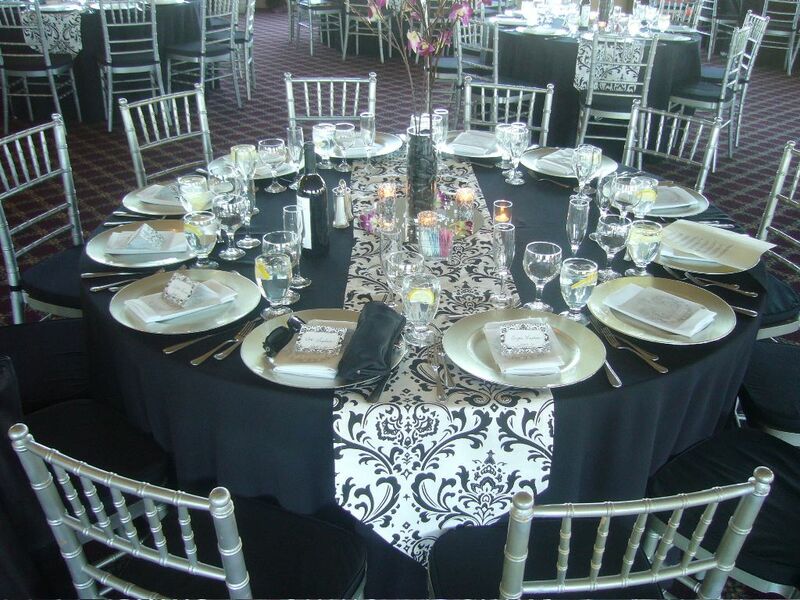 From laying out silver sequined table runners to having silver and black printed fabric runners, you can stylize your tables in different ways. Like silver, gold too brings glamour to a wedding table. From shimmering golden sequin table runners, to strips of white and gold on fabrics, to prints, table runners of today can have different styles in metallic shades. Golden accents on table runners can make even a boring wedding table stand out in style. The golden table runner ideas showcased below will show exactly why people go in for this mesmerizing color on their big day. Yeah…the answer is pretty simple! Everyone wants to have a glam wedding and nothing can be more glamorous than gold! 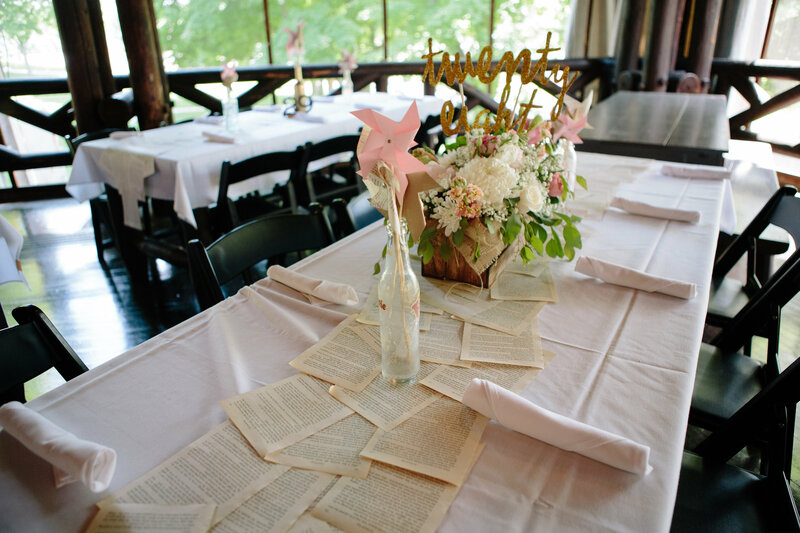 Paper table runners may sound boring, but, when you place them on wedding tables, these make a distinct style statement. Paper can be used singularly as runners, or can be made into different shapes like flowers and then be used as decorative table runners for weddings. While, light brown or cream paper runners look elegant, the runners involving paper flowers lend sweetness to a decor. These are perfect if you want to have a vintage styled wedding. 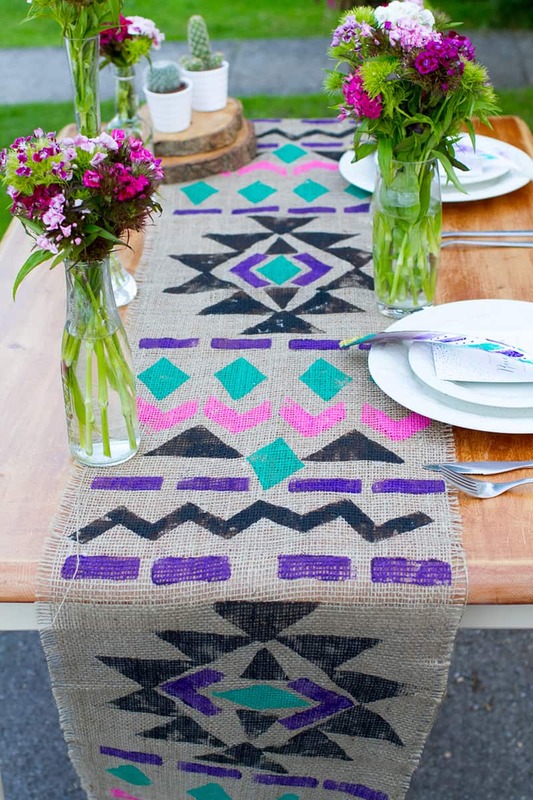 DIY table runners for wedding are not just easy on the pocket, but are very sassy in look. You can make confetti table runners all by yourselves or with the help of experts. There are other designs that can be made using paper, colors, fresh flowers and readily available things. Even old book pages can be spread out on the table as runners like in the below image. For a Japanese themed wedding, you can design a table runner with the help of Kimono Fabric or can have an Aztec Wedding by incorporating the native designs and patterns. 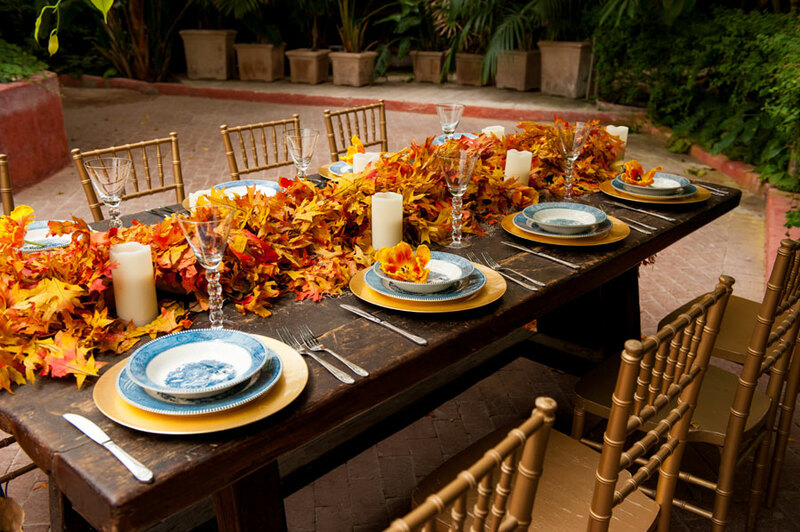 For an autumn wedding, try placing a floor length fall leaf table runner that is cheap as well. For outdoor weddings, rustic theme is always the first choice. Rustic elements can be brought together on your wedding tables like wooden slabs with inbuilt candle holders, leaves and burlap. 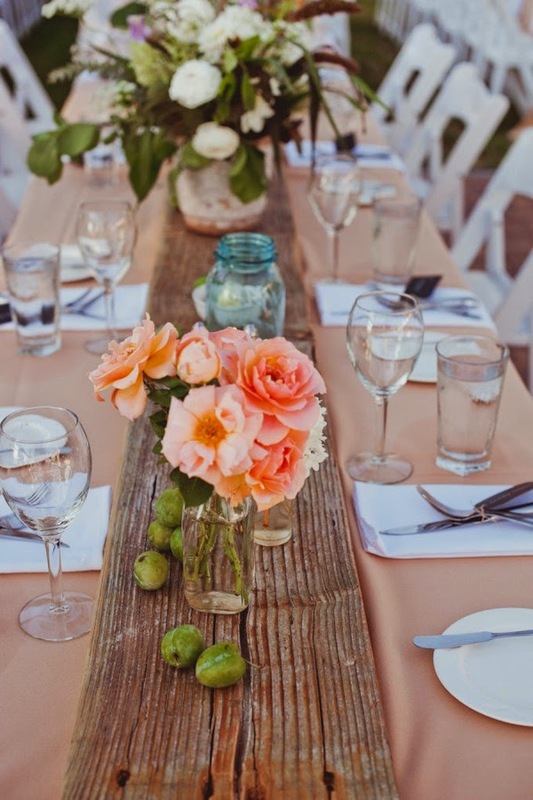 Look below to spot some cool wedding table runners in rustic style that make you fall in love with this theme. You can have an indoor wedding too where the theme is rustic. Weddings are special and demand that you choose the best of everything for your D Day. 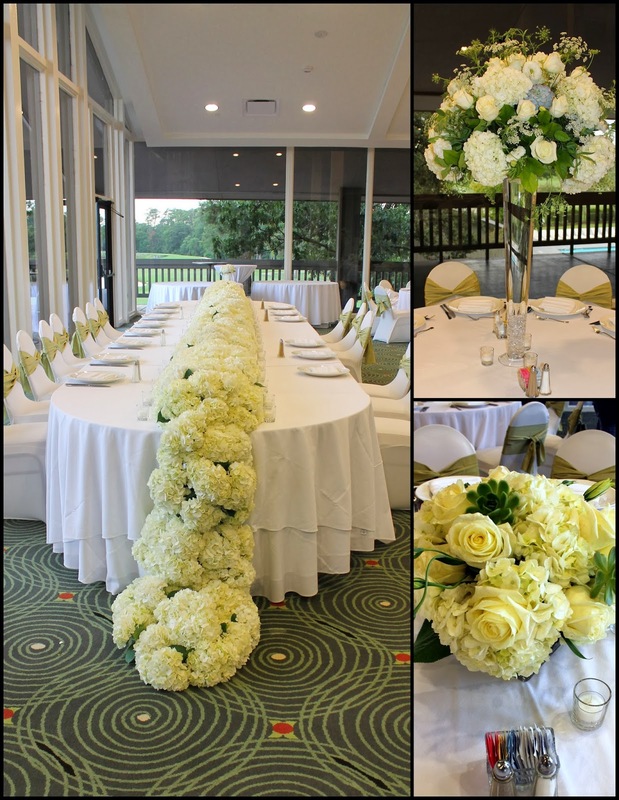 From venue decor, to tables, everything needs to be perfect. Your wedding tables can now wear a spruced up and glam look when you go in for these trendy *Wedding Table Runners*.